When campaigning for the presidency, George W. Bush, then Governor of Texas, famously proclaimed, “I’m uniter, not a divider.” I aim to show that no elected executive head of state (in other words, no head of state in a presidential or semi-presidential system) could possibly fulfill this function. The American Presidency has evolved into a contradictory office: as the head of state, the President represents the country and attempts to act as a unifying figure; as the head of government, the President acts as a divisive figure by representing his party and supporters and implementing his policies. This contradiction has arisen because the Framers who wrote the Constitution of 1787 designed the American Presidency as a republican version of the British Sovereign under the British Balanced Constitution of the 18th century. While Westminster parliamentarism evolved into Responsible Government in the 19th century, thus separating the head of state from the head of government, the American Presidency remains locked into the Balanced Constitution, which Americans now call “the separation of powers”, or “checks and balances.” Under this balanced constitution, the Framers intended that the House of Representatives represent the American people as a whole as the democratic element (which came from the House of Commons), that the Senate represent the States as the federal element (which derived from the aristocratic element of the House of Lords), and that the President represent the American State as the executive element (a republican adaptation of the British Sovereign). The only President whose contemporaries could plausibly have described him as a unifying figure was George Washington. The inherent tension within the Presidency, between head of state and head of government, makes the office contradictory because two distinct, and sometimes contradictory, functions have become bound up in the same person. Even when the President emphasizes one role over the other, he still embodies both and must always bear both in mind. The American President is an “executive head of state” because he possesses both power and authority. In terms of power, he determines government policy, plays an active role in promoting particular legislation in Congress, and runs the political executive. In terms of authority, he carries out ceremonial functions and leads national commemorations and celebrations. As head of state, the President possesses both official and personal authority; as head of government, he possesses real political power. In contrast, a non-executive head of state possesses authority, but the Prime Minister and Cabinet exercise power. Most political scientists do not properly articulate the differences between power, authority, and coercion, and influence as persuasion. However, Dr. Paul Benoit made these essential distinctions in “State Ceremonial: The Constitutional Monarch’s Liturgical Authority”. Though he wrote about the differences between the role of a constitutional monarch within the State and within civil society, the concepts still apply to republican presidencies. In general, authority refers to the “unquestioning recognition that some person or office is superior in some way and therefore worthy of respect and deference.” In this case, the Constitution of the United States vests the Office of the Presidency with official authority, and the individual’s charisma, popular support, and personal conduct determine his personal authority. His personal authority can reinforce his power. “Power comes from a consent that is freely given in an explicit or tacit manner; it increases as the will of more and more people is united through agreement, cooperation, and organization.” In constitutional monarchies like the United Kingdom, the Sovereign embodies authority (both within the State and government, and within civil society), while the Prime Minister and his government wield power, which they obtain by commanding the confidence of the House of Commons. Coercion refers to forcing someone to do something against his or her will through intimidation or threat. Authority and power may manifest themselves as persuasion. Democratic political systems thereby operate primarily upon power, while dictatorships rely on coercion (the threat of force and retribution) in order to keep populations in line. This political force certainly does not apply to the American presidency, but several presidential republics in Latin America suffered from leaders who took power and subsequently resorted to coercion in order to solidify their grip on the office. Hugo Chavez comes to mind. Juan Linz has argued that parliamentary systems (which includes both parliamentary republics and constitutional monarchies) lend themselves to long-term democratic stability more effectively than presidential republics and that they can secure the transition from authoritarian regime to a democratic institution more effectively than presidential republics. The former allow for loyal opposition and separate the head of state from the head of government. The separation of the head of state from the head of government separates authority from power, and thus limits the capacity of each figure to become a despot or a demogogue. It is precisely this confluence of authority and power that could lead to despotism and demagoguery in countries that lack liberal democratic political cultures. 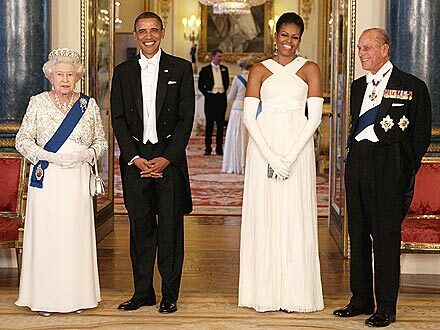 President Obama and Queen Elizabeth II both wear formal, state dress and stand respectably apart. 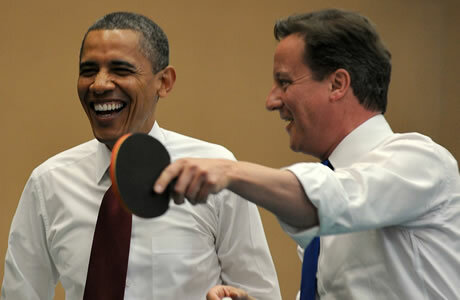 President Obama and Prime Minister Cameron are far more relaxed and familiar with one another. The President acts unambiguously as head of state when he accepts the letters of credence of ambassadors and when he holds audiences or events with foreign non-executive heads of state (from republican or monarchical parliamentary systems), because these do not involve serious discussions on government policy. They could act as a prelude for subsequent meetings with that country’s head of government or other members of the political executive. However, the President emphasizes his role as head of government whenever he meets foreign executive heads of state and government and discusses real policy and political questions. For instance, the President acts differently when he hosts or visits the Queen of the United Kingdom versus the Prime Minister of the United Kingdom. When the President of the United States meets the Queen of the United Kingdom, he wears full State dress (normally white ties and long jackets), and the meetings focus on maintaining good diplomatic relations. When he meets the Prime Minister of the United Kingdom, he wears a normal business suit (or even less formal attire) and the two engage in substantive policy discussions and hold joint press conferences. President Obama endured an awkward official dinner — including a diplomatic faux pas of toasting the Queen during the playing of “God Save the Queen” — but he attended a basketball game and acted all chumy with Prime Minister Cameron. 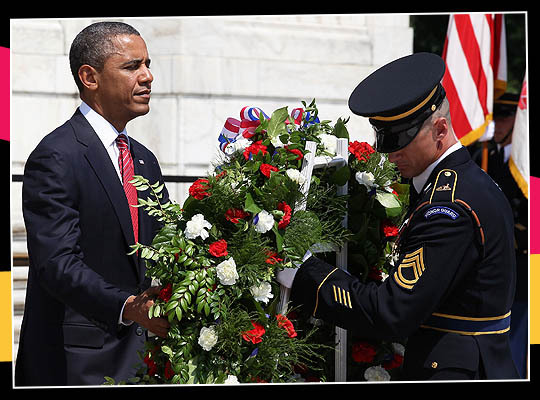 President Obama fulfills his liturgical role by commemorating Memorial Day. The President’s role of head of state and representative of the country can sometimes extend beyond the State and touch civil society, in the same way that a constitutional monarch fulfills a “liturgical role” of a civic or quasi-religious ceremony. During times of national tragedy, the President must emphasize his role as head of state and articulate the country’s grief with dignified solemnity. President Reagan exemplified the role when he addressed the nation in the aftermath of the destruction of the Shuttle Challenger; President Bush fulfilled the function in response to a much larger event, after the terrorist attacks of September 11, 2001. Presidents even tend to evoke religious scripture and imagery in carrying out their liturgical function. The President also fulfills his liturgical function on the annual commemorations for Memorial Day and Veterans’ Day and on the annual celebration of Independence Day. The President’s political opponents normally refrain from criticizing him on these occasions, because they would seem petty by putting partisanship above patriotism. That latter point raises some interesting implications and questions: namely, it is unpatriotic to criticize the President when he acts as head of state and fulfills the liturgical function of articulating the country’s grief. It may also be unpatriotic to criticize the President when he expresses clear statements on the national interests of the United States, particularly during times of war. In contrast, it is rarely if ever unpatriotic to criticize the Prime Minister in a Westminster system, and I would argue that such criticism should never be considered unpatriotic. In the absence of a non-executive head of state, bipartisanship serves as the closest American equivalent to the political neutrality of the Sovereign. Americans thus expect their President to be bipartisan (acknowledging both the Democrats and Republicans) during these solemn occasions, or with respect to important political questions that affect American interests and values. But bipartisanship – a temporary mutual truce against uni-partisanship – does not constitute neutrality, because each side retains its vested partisan political interests and ambitions throughout. Whoever first resumes partisan hostilities faces the consequences of appearing petty. The art and essence of being “presidential” lies in the mastery of this civic liturgy. Once the president is the president, there is no leader of the opposition. There is no kind of ‘president-in-waiting’. We have an opposition which is always an alternative government. This is why, in the United Kingdom, Britons who disagree with the policy decision to invade Iraq in 2003 can casually refer to former Prime Minister Anthony Blair as a “war criminal,” or such such pejorative political epithets, without raising much controversy. (Such remarks feature prominently on British comedies such as Have I Got News For You and QI). If anything, most Britons treat such statements as a joke. But they would never think of calling Queen Elizabeth II a war criminal because Her Majesty’s Government, not Her Majesty, determines government policy. A notable exception to this general principle of Responsible Government and the Doctrine of Royal Infallibility occurred following the hysteria over Princess Diana’s death in August 1997: a majority of Britons felt (because they certainly were not thinking) that the Queen had not acknowledged their “grief”, and a curious inversion of roles took place. Prime Minister Anthony Blair gladly assumed the liturgical role through his “People’s Princess” speech. There is nothing axiomatically wonderful about republics or presidents. And I often made this point during the Iraq War to those in [the United Kingdom] who protested against it, like me. I used a considerable amount of mockery and disrespect to the prime minister at the time, Mr. Blair. If you did that to President Bush in the United States, you’d be in serious trouble, because in the United States the head of government is also the head of state, [which] therefore demand[s] loyalty and patriotism from everybody. And to criticize him personally is viewed by many people as a form of lese-majeste. Politics by nature is and should be divisive. Without the disagreement and dissent that comes from persons who sincerely hold opposing views and beliefs, politics would cease to exist altogether. The exercise of political power is therefore also inherently divisive. Executive power entails decision-making: implementing one option to the exclusion of all others. Within any political system, each possible option, course of action, and set of policies retains the support of various competing interests; within a democratic political system, these competing interests – whether political parties, citizens, or other groups – may legitimately oppose one another and the executive’s decisions. With popular election comes what Przeworski famously dubbed the “institutionalized uncertainty” in which legitimate political opposition must oppose and offer an alternative to the government of the day. The inherently divisive nature of political and executive power means that no elective, executive head of state in a democratic country can act as a unifying national figure and command the loyalty and devotion of all citizens in the manner that absolute monarchs once sought (or coerced) from their subjects. The Prime Minister Does Not ‘Represent All Canadians’ – the House of Commons Does! Paul Benoit. “State Ceremonial: The Constitutional Monarch’s Liturgical Authority,” in The Evolving Canadian Crown, edited by Jennifer Smith and D. Michael Jackson, 119-137. (Kingston: Institute of Intergovernmental Relations, School of Policy Studies, Queen’s University, 2012). Benoit, “State Ceremonial: The Constitutional Monarch’s Liturgical Authority,” 120. Paul Benoit, conversation with author, January 2012. Juan Linz, “The Perils of Presidentialism,” Journal of Democracy 1, no. 1 (January 1990): 51-69. Benoit. “State Ceremonial: The Constitutional Monarch’s Liturgical Authority,” 119-137. I suppose that in Australia, both the House and Senate represent the people because they are both elective chambers. Paul Benoit, “Parliament and Democracy in the 21st Century: The Crown and the Constitution,” Canadian Parliamentary Review 25, no. 2 (Summer 2002): 2-3. Margaret Thatcher, interview by Brian Lamb, CSPAN, 9 March 1991. Sarah Hagen, conversation with author, 2 June 2012. CNN, “Dixie Chicks Pulled From Air After Bashing Bush,” 14 March 2003; Peter Hitchens, presentation to the Orwell Prize Shortlist Debate, 27 April 2011. Peter Hitchens, interview with Brian Lamb, CSPAN, 30 January 1998. Christopher Hitchens, interview by Jeremy Paxman, Newsnight, BBC, 26 November 2010. [accessed 1 June 2012]. Peter Hitchens, The Abolition of Britain, interview by Brian Lamb, Booknotes, CSPAN, 20 October 2000. [accessed 1 June 2012]. This entry was posted in Loyal Opposition, Parliamentarism v Presidentialism, Reaffirmation of, Separation of Powers and tagged Anthony Blair, bipartisanship, Brian Lamb, Christopher Hitchens, head of state vs head of government, Juan Linz, Margaret Thatcher, Paul Benoit, Peter Hitchens, power vs authority, public liturgy, royal infallibility. Bookmark the permalink.